Airplane rides, thrill of a lifetime rides & flying lessons! 1.800.HARVAIR • harvsair.com/adventures By Jennifer McFee for the Free Press ENTERTAINMENT ABOUNDS AT ASSINIBOINE PARK WHERE A JAM-PACKED SUMMER SCHEDULE OFFERS FUN FOR ALL AGES. Assiniboine Park Zoo is a hub of activity where curious crowds are gathering for a new exhibit entitled Dinosaurs Alive that is included with regular zoo admission. Assiniboine Park Conservancy spokesperson Laura Curtis says the exhibit has been extremely popular since it opened May long weekend featuring 15 life- size animatronic dinosaurs that will remain on display until Sept. 5. "There is a variety of different species that move and make sound so the visitors can see how they may have looked and acted millions of years ago. There's also a dig site where kids can go in and get a little dirty in the sand while they dig out some dinosaur bones," Curtis says. "There are lots of kids who love dinosaurs, but we've seen that adults of all ages love dinosaurs too. We've never had something like this at the zoo before, so we're really hoping lots of people come and see it this summer." All summer long, the zoo is also featuring 14 daily Keeper Talks with zookeepers discussing different animals while focusing on the environment and wildlife conservation. "While we want to teach people about those animals, we also want to talk about things we can all do in our lives to be environmentally friendly and help save wildlife," Curtis says. Adding to the enjoyment, the brand new Winston's Ice Cream Shoppe is now open, featuring old-fashioned scooped ice cream to beat the summer heat. Kids will also be eager to try out the bouncy castles in the zoo's Summer Fun Zone. Two popular seasonal exhibits are back, so visitors can look forward to walking with kangaroos in the Australian Walkabout and getting a close-up glimpse of butterflies in the Shirley Richardson Butterfly Garden. Outside the zoo, the fun continues throughout Assiniboine Park with an impressive lineup of more than 30 events for the Summer Entertainment Series, which is free to the public. Each Sunday afternoon from 3 to 4 p.m., jazz musicians will entertain outdoor audiences at the Leo Mol Sculpture Garden. Jazz-lovers will want to stick around after that for Sunday night smooth jazz at the Lyric Theatre, which runs from 7 to 8:30 p.m. The summer music series also offers a variety of other concerts on the Lyric stage, showcasing the talents of the Winnipeg Pops Orchestra, the Winnipeg Symphony Orchestra, the Ron Paley Big Band and many more. As well, the much-anticipated Ballet in the Park will dazzle crowds with performances from Canada's Royal Winnipeg Ballet from July 27 to 29. The entertainment continues with movies in the park every Friday evening in August, with early features at 7 p.m. followed by late features at 9:15 p.m. "We try to pick recent blockbuster movies that would look really good on a big screen so that it draws lots of people out. You see lots of people setting up picnics and enjoying the show. We also have concessions there, so you can get popcorn, drinks, hotdogs and everything you could at a regular theatre — except you get to enjoy the movie under the open sky," Curtis says. "The movies and music are all free, so it's a really great way to come out and enjoy the weather, grab a seat on the Lyric lawn and listen to some music or catch a movie." For a full schedule of events and activities, visit www. assiniboinepark.ca or check out updates on Facebook, Instagram and Twitter. 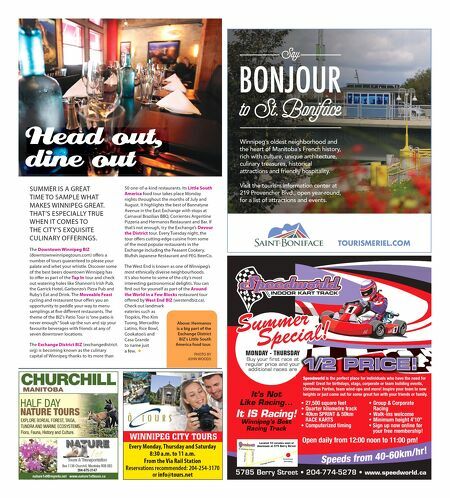 ✹ Dinosaurs Alive (above) has been a hit with dinosaur lovers of all ages while Ballet in the Park is a summertime fixture at Assiniboine Park. 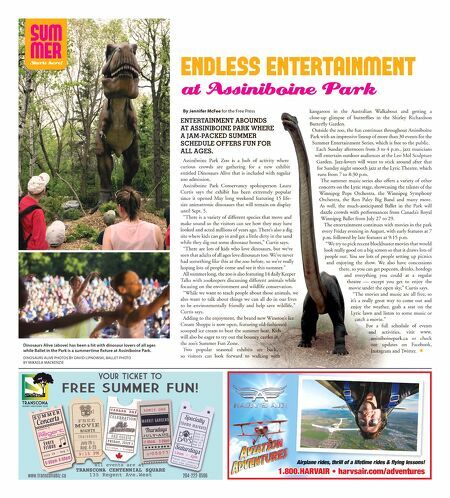 DINOSAURS ALIVE PHOTOS BY DAVID LIPNOWSKI, BALLET PHOTO BY MIKAELA MACKENZIE By Jennifer McFee for the Free Press ENTERTAINMENT ABOUNDS AT ASSINIBOINE PARK WHERE A JAM-PACKED SUMMER SCHEDULE OFFERS FUN FOR AGES. Assiniboine Park Zoo is a hub of activity where curious crowds are gathering for a new exhibit entitled Dinosaurs Alive that is included with regular admission. Assiniboine Park Conservancy spokesperson Laura Curtis says the exhibit has been extremely popular since it opened May long weekend featuring 15 life- size animatronic dinosaurs that will remain on display "There is a variety of different species that move and make sound so the visitors can see how they may have looked and acted millions of years ago. There's also a dig site where kids can go in and get a little dirty in the sand while they dig out some dinosaur bones," Curtis says. "There are lots of kids who love dinosaurs, but we've seen that adults of all ages love dinosaurs too. We've never had something like this at the zoo before, so we're really hoping lots of people come and see it this summer." All summer long, the zoo is also featuring 14 daily Keeper Talks with zookeepers discussing different animals while focusing on the environment and wildlife conservation. "While we want to teach people about those animals, we also want to talk about things we can all do in our lives to be environmentally friendly and help save wildlife," Adding to the enjoyment, the brand new Winston's Ice Cream Shoppe is now open, featuring old-fashioned scooped ice cream to beat the summer heat. Kids will also be eager to try out the bouncy castles in the zoo's Summer Fun Zone. Two popular seasonal exhibits are back, so visitors can look forward to walking with kangaroos in the Australian Walkabout and getting a close-up glimpse of butterflies in the Shirley Richardson Butterfly Garden. Outside the zoo, the fun continues throughout Assiniboine Park with an impressive lineup of more than 30 events for the Summer Entertainment Series, which is free to the Each Sunday afternoon from 3 to 4 p.m., jazz musicians will entertain outdoor audiences at the Leo Mol Sculpture Garden. Jazz-lovers will want to stick around after that for Sunday night smooth jazz at the Lyric Theatre, which runs from 7 to 8:30 p.m. The summer music series also offers a variety of other concerts on the Lyric stage, showcasing the talents of the Winnipeg Pops Orchestra, the Winnipeg Symphony Orchestra, the Ron Paley Big Band and many more. As well, the much-anticipated Ballet in the Park will dazzle crowds with performances from Canada's Royal Winnipeg Ballet from July 27 to 29. The entertainment continues with movies in the park every Friday evening in August, with early features at 7 p.m. followed by late features at 9:15 p.m. "We try to pick recent blockbuster movies that would look really good on a big screen so that it draws lots of people out. You see lots of people setting up picnics and enjoying the show. We also have concessions there, so you can get popcorn, drinks, hotdogs and everything you could at a regular theatre — except you get to enjoy the movie under the open sky," Curtis says. "The movies and music are all free, so it's a really great way to come out and enjoy the weather, grab a seat on the Lyric lawn and listen to some music or catch a movie." For a full schedule of events and activities, visit www. assiniboinepark.ca or check out updates on Facebook, Instagram and Twitter.